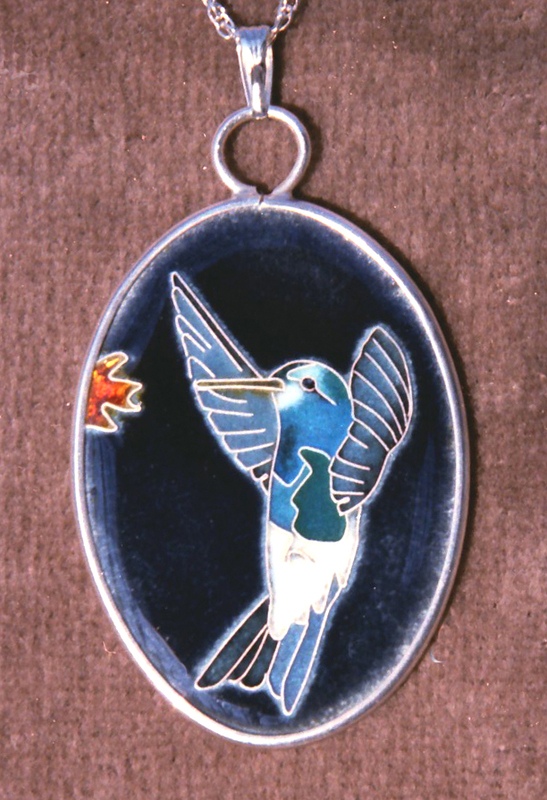 As I became more adept at the techniques of enameling, I began to feel daunted by the power of the art form. 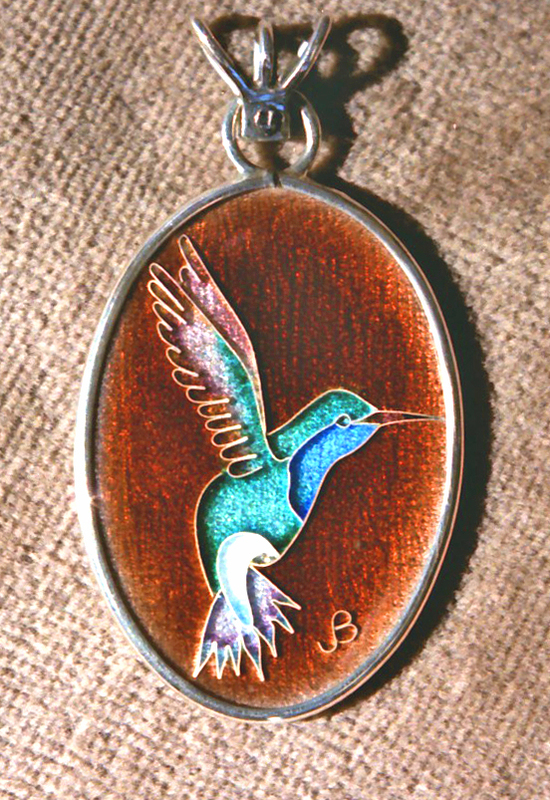 It offered tremendous opportunities through freedom of proportion, rich colors, and its ability to emphasize line work. Using such features, I realized, was subject to principles and rules that I had not studied beyond the first year of high school, and had never really grasped. Anxious to learn quickly, I reasoned that most of these principles and rules probably expressed the preferences that nature had instilled in us long ago. Nature, then, was the arbiter of what was artistically sound. My starting point would be to prepare realistic images of natural subjects. Abstraction could come later. 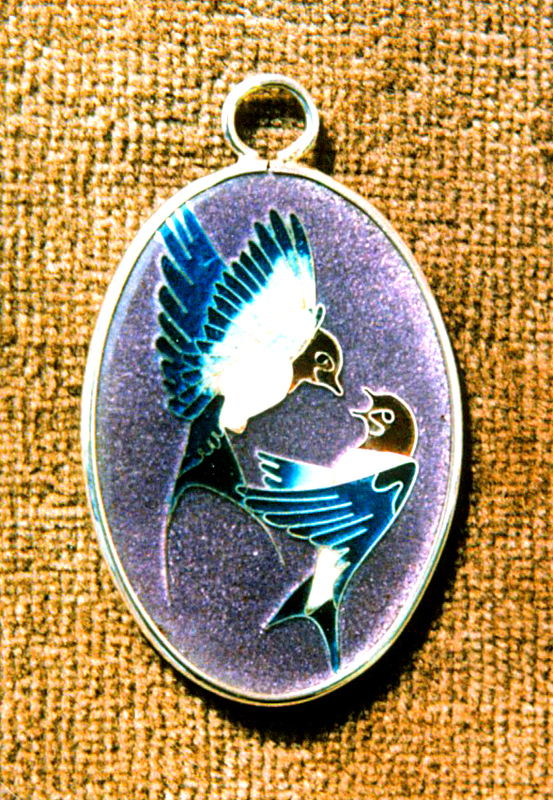 I began with birds. 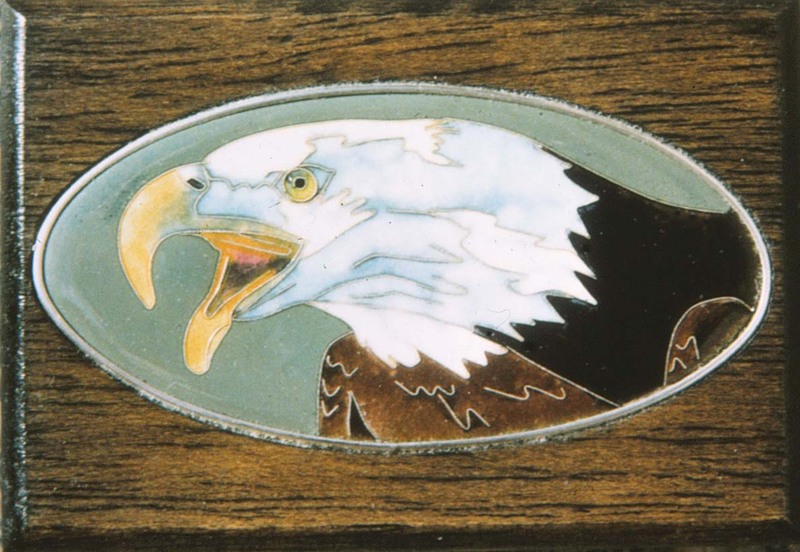 Which was better to start with than the bald eagle? I sensed that nature would not only guarantee the artistic soundness of this image, but would also add a touch of drama reflecting the personality of this fearless hunter. 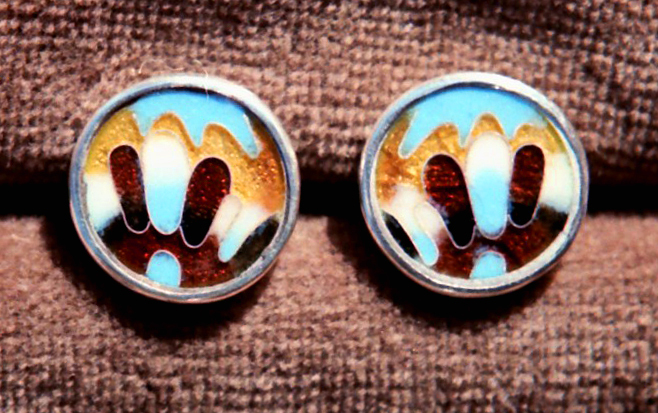 It worked reasonably well, both small (on cufflinks) and large (on a box lid). Other species followed in short order. 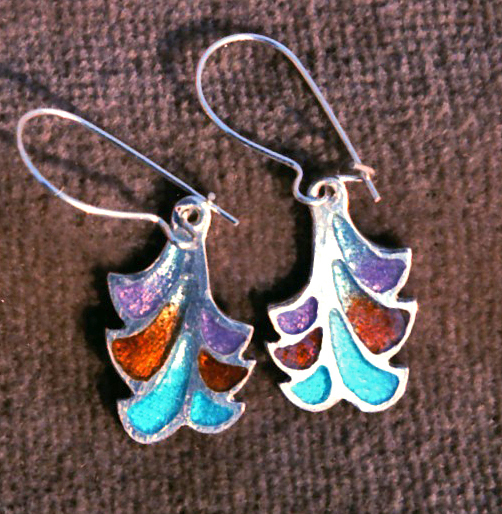 Feeling more comfortable about choice of color, I began taking small liberties with what nature had provided. 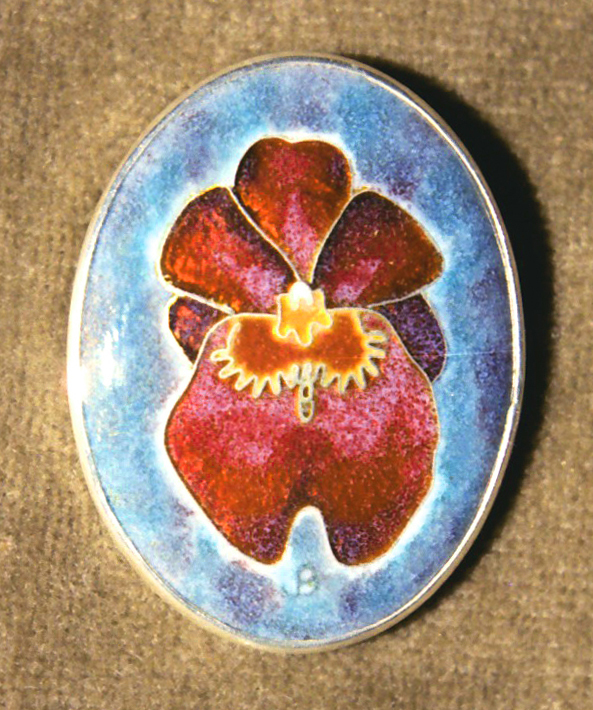 In some cases, a realistic pendant or brooch might be accompanied by more abstract smaller accessories like earrings and cufflinks. 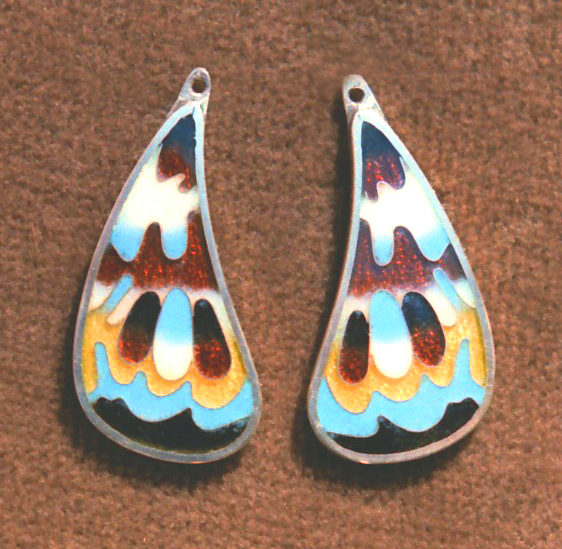 Of the two pairs of “button” earrings shown below, the pair on the left reflects elements of numerous bird images; on the right, the enlargement of a small detail of a butterfly’s wing. 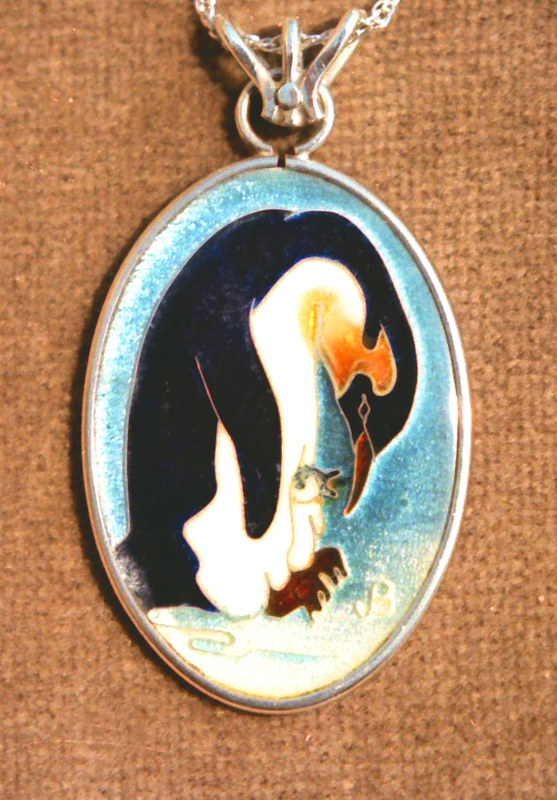 Again, the penguin image on the pendant is a source for abstractions on the first pair of accompanying earrings. 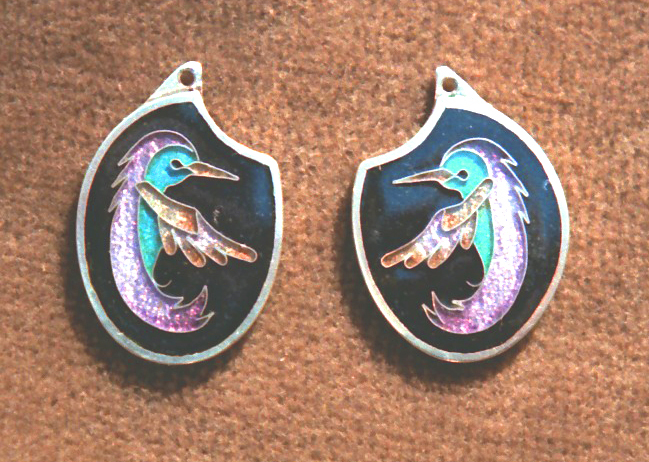 Hummingbird images are caricatured on the second pair. 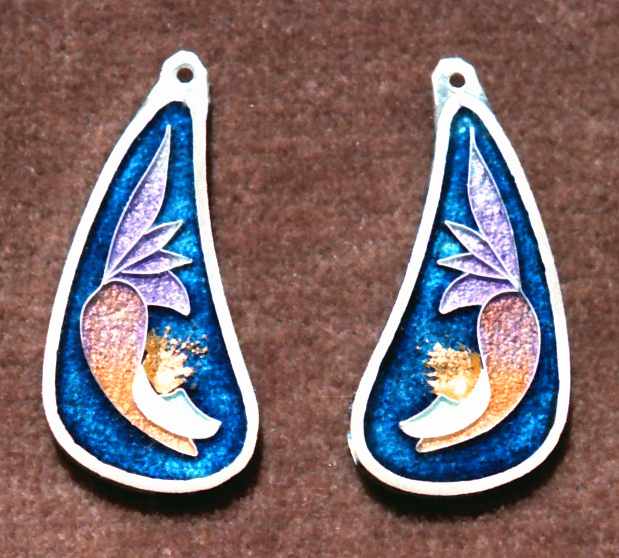 In the third pair, the avian origin is mostly lost in abstraction. Finally, we present a “copy of a copy” of nature. 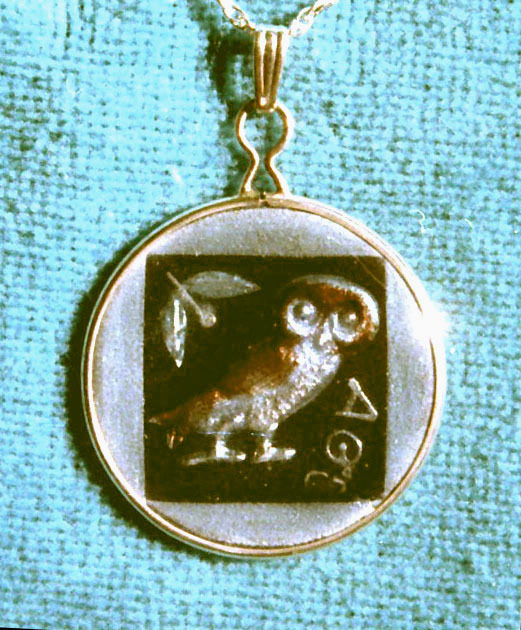 The ancient Athenians used a wise owl to represent their patron Athena, goddess of wisdom and war. And so they used an owl to decorate their silver tetradrachm, considered by many to be the most beautiful of all the coins ever minted. 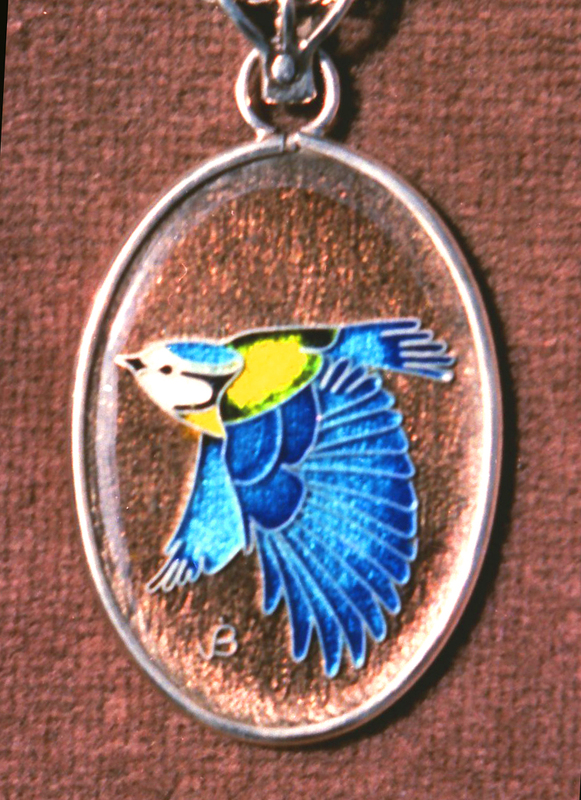 Here is a rendition of the coin in enamel. 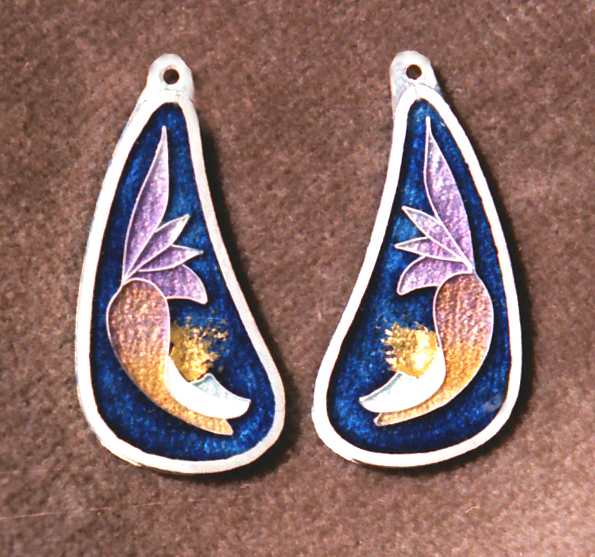 It was made by the basse-taille (low-relief) technique; relief was obtained by embossing a thin sheet of fine silver. 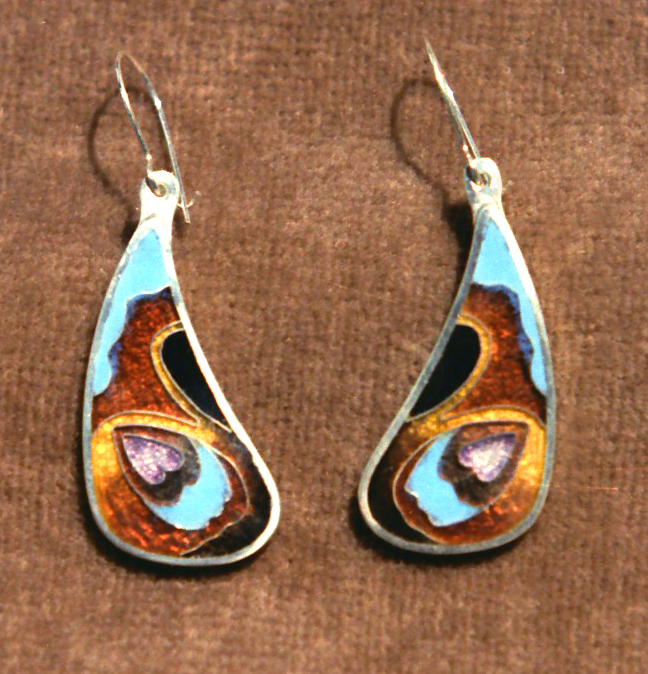 Alpha and Omega is a work that justifies the “metal arts” part of the series title. 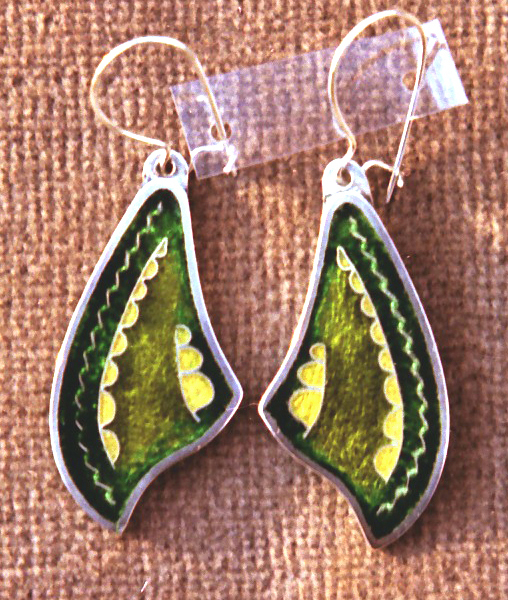 It achieves its rich color without benefit of enamel. 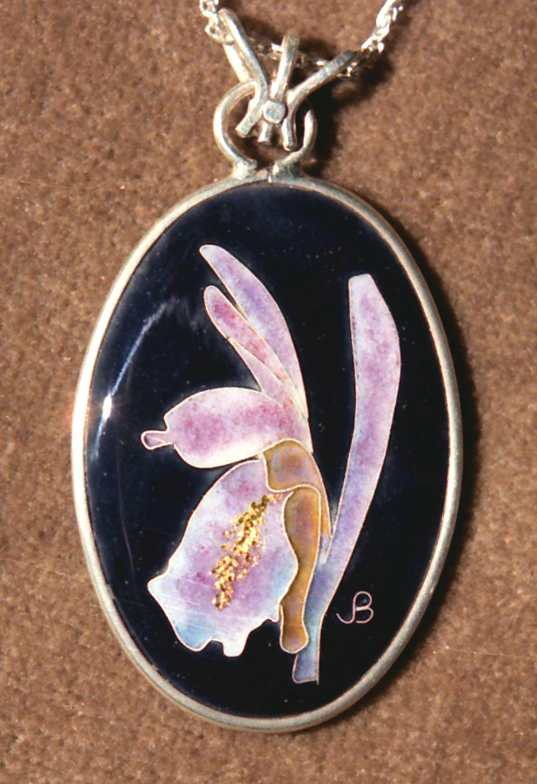 It features a star sapphire, a generous gift from our son, Philip, to his mother. 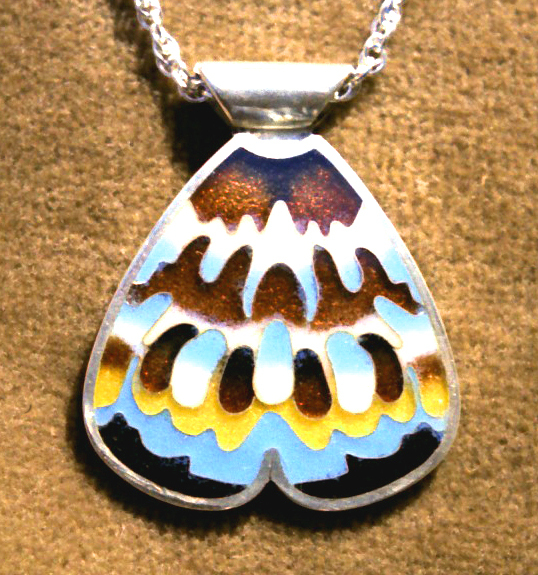 I constructed the setting, a pendant consisting of several sheets of fine silver, each sawn to shape, and silver-soldered together as layers. 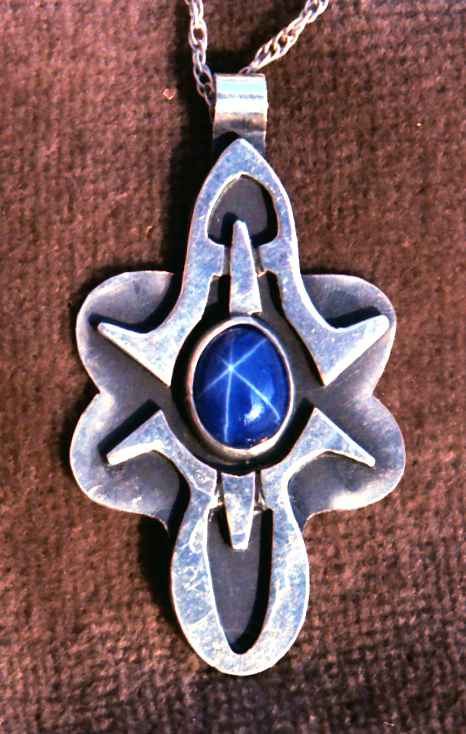 In a mineralogy class, I learned that the six-pointed star seen in the sapphire is actually the reflection of a consistent geometric pattern by which the atoms of the various elements are arranged within the crystal. 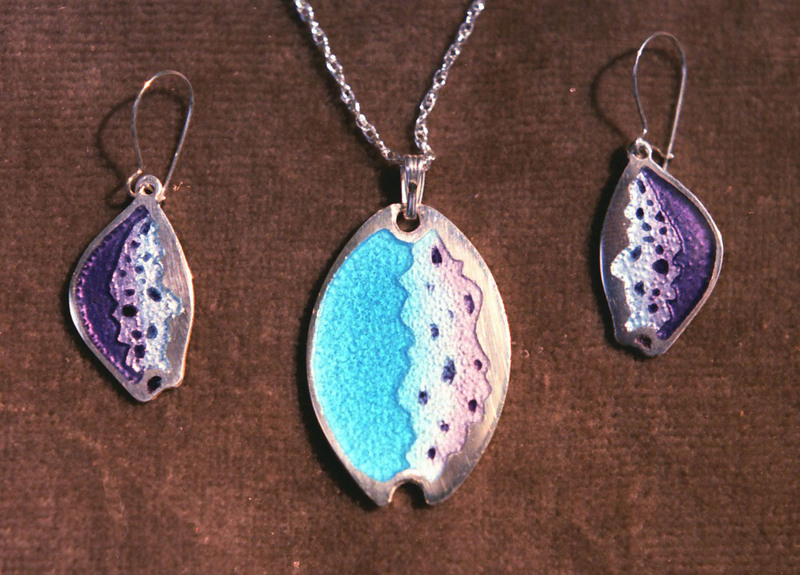 Seeing this evidence of atomic properties seems almost to be an otherworldly experience. 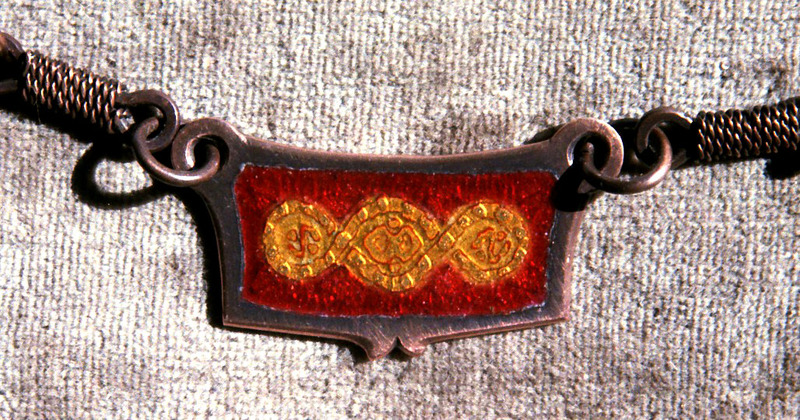 To make the point that the atoms and we are in the same world, I began by enclosing the entire design within the symbols for Alpha and Omega, the beginning and the end. 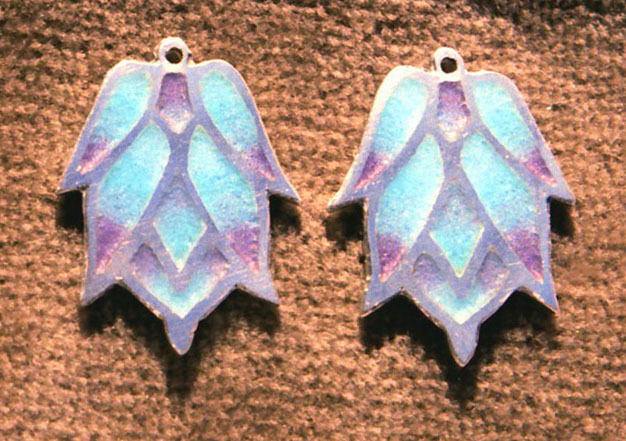 Six silver rays, extensions of the star points, penetrate to the limits of that world. 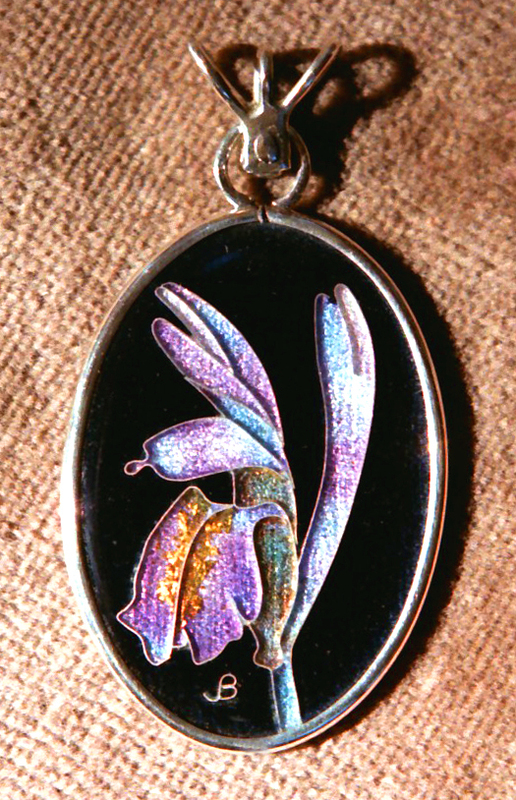 Healing Fragrance is an enamel of the grisaille technique, with an overlay of transparent colored enamels, mounted on a silver pendant. 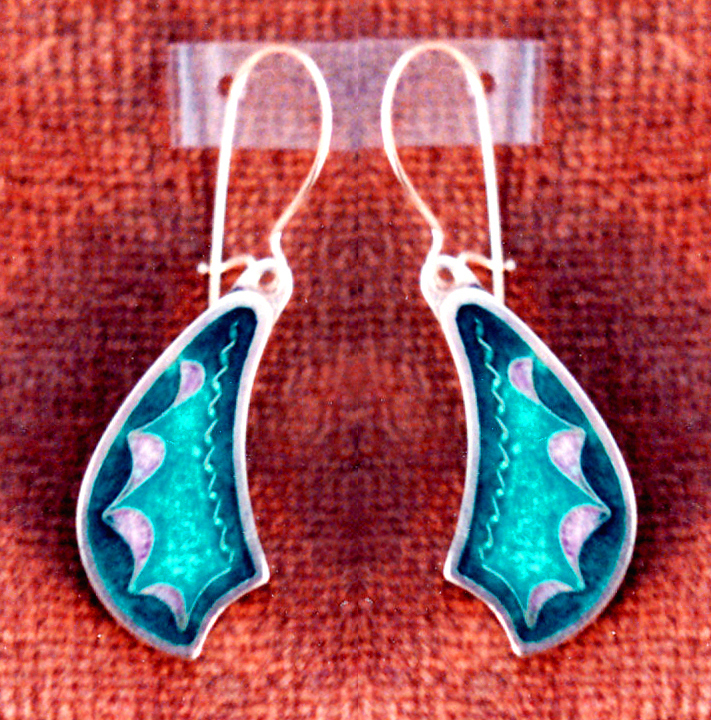 The technique was developed many centuries ago, but is in relatively uncommon use today. Grisaille refers to the subtle gradations among shades of gray, in addition to black and white, that are produced by this technique. After seeing the photo of a 13th-century grisaille with color overlay, I was inspired to add this secondary technique. 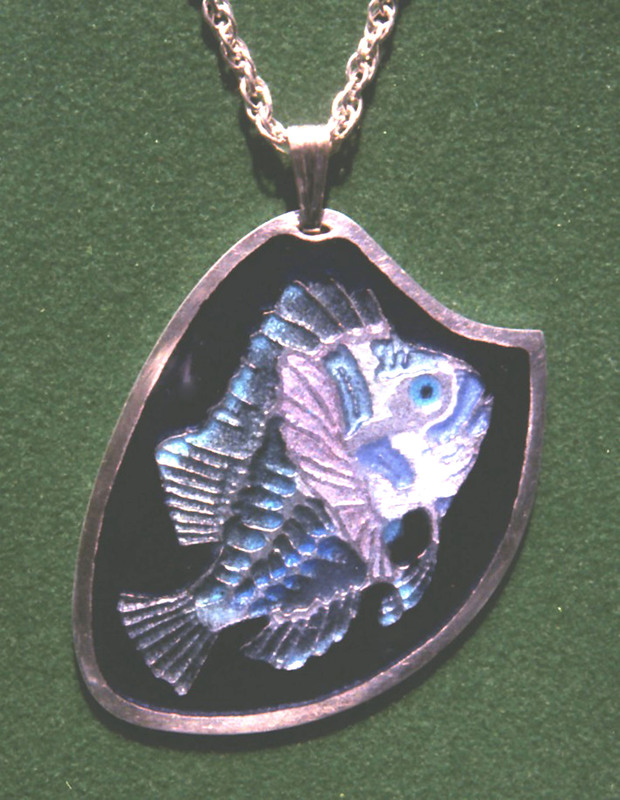 The basic grisaille is prepared with only two enamels, specific formulations of black and white, fused on metal. 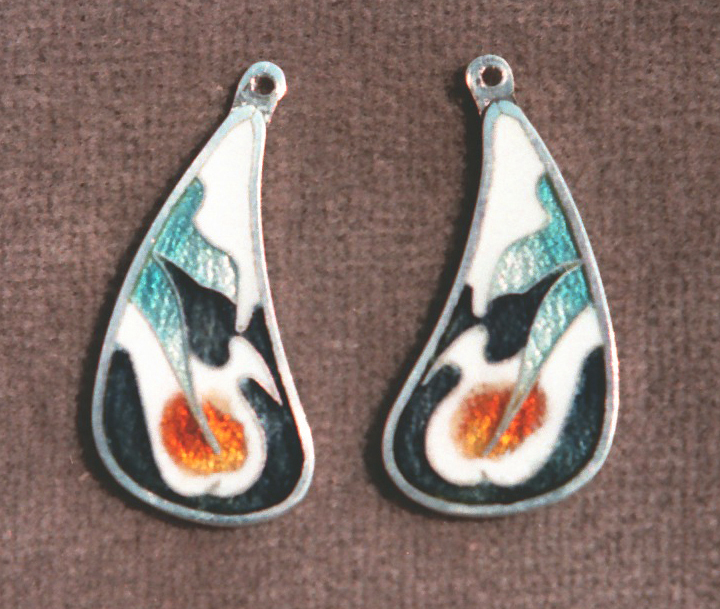 On a thick coating of several layers of black enamel, the white enamel is applied in a sequence of layers that vary in number and thickness according to the shade of gray or white desired. 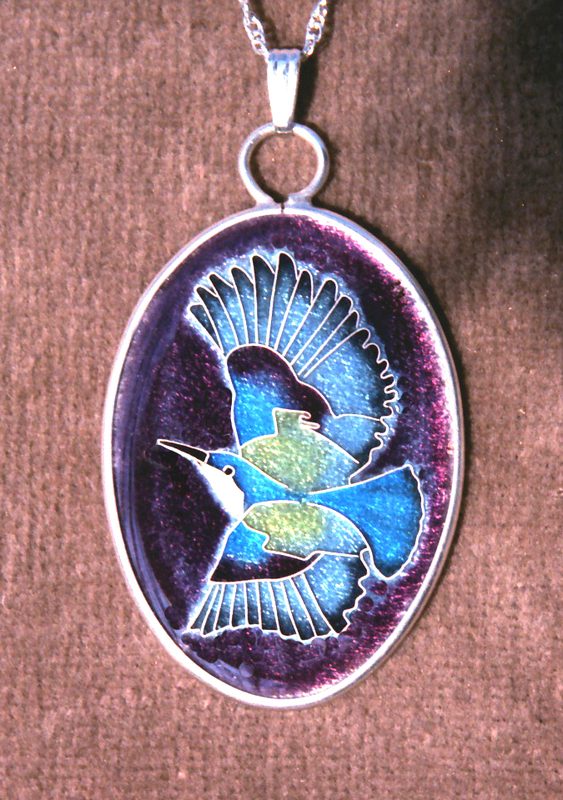 The piece is fired after each new layer is applied. Through a sequence of high-temperature and normal-temperature firings, the image is produced with subtle gradations among the various shades. 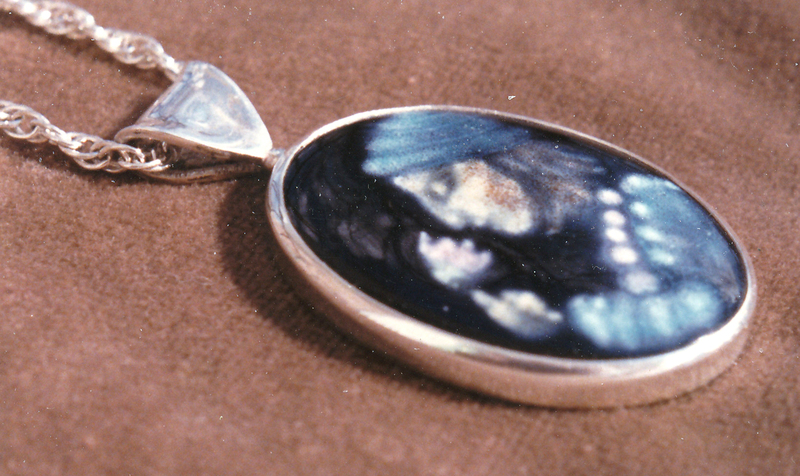 To produce the color overlay, a thin layer of transparent enamels of various colors is fired over the grisaille image; this is analogous to the hand coloring of a black-and-white photograph. 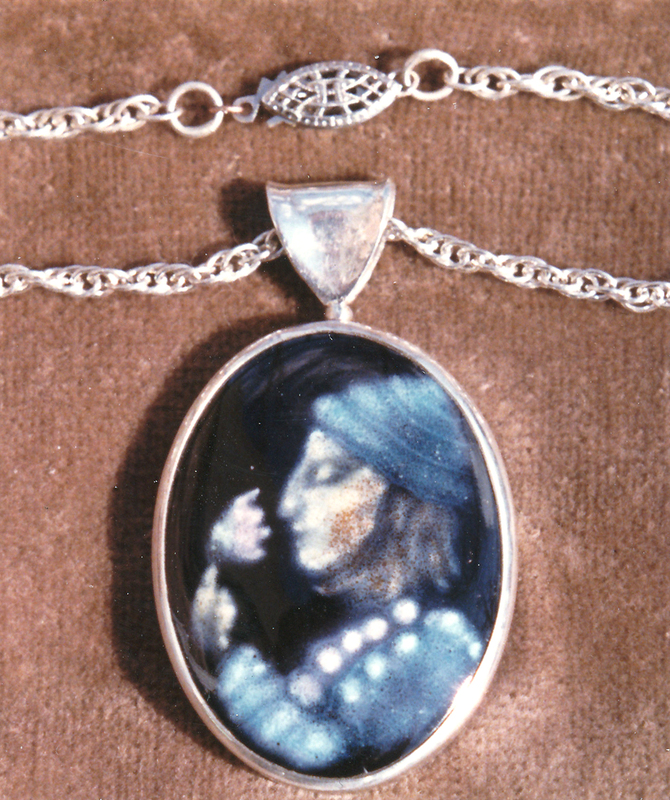 The work features an approximate likeness of my wife, Jaquelin, as she appeared in the mid-1980s. She was severely depressed over failing health and increasing neurological problems, which eventually led to a major stroke and many years as an invalid. With little success, I tried to divert her attention into more pleasant and relaxed directions – figuratively, to “smell the flowers.” Healing Fragrance presents a fantasy in which she indeed smells the flowers.